Inspired by a Tutorial for the #31DC2016Weekly - Polish Etc. I finally have my nail art look for this past week's #31DC2016Weekly challenge. This past week, we were doing nail art inspired by a tutorial. Nail art tutorials are flooding social media over the past year. With the addition of video to Instagram, there have been an over abundance to tutorials available to everyone. It used to be just a blog thing and a little bit on YouTube. But now you can learn how to do any type of nail art technique with the flick of a finger. I decided to follow an old tutorial by my favorite short nailed lady, The Nailasaurus. Sammy does great tutorials and is a huge inspiration for me. Love her. You can find her quilted nail tutorial here! For this manicure, I started with a base of Kiko "Pearly Golden Coffee #514" which is a dark brown with golden shimmer. I applied two coats and a quick dry glossy top coat. After I let that dry for a few minutes, I added a matte top coat. Before that dried completely, I used a dental floss pick to create the cross hatch that gives this mani a quilted look. I tried to make them as uniform as possible but obviously they are not perfectly spaced out. Oh well! I still think it looks super neato. I added tiny gold caviar beads to the intersections with a little bit of top coat. For a little extra pizzazz, I also added a few accent nails of OPI "What Wizardry is This?" which is a brown/golden textured polish. Overall, I am pretty happy with this manicure. I would have liked my lines to be more uniform but in real life, you can't really tell. I want to try this in a ton of other colors and maybe try it with a glossy top coat instead of matte. Have you ever done a quilted mani before? 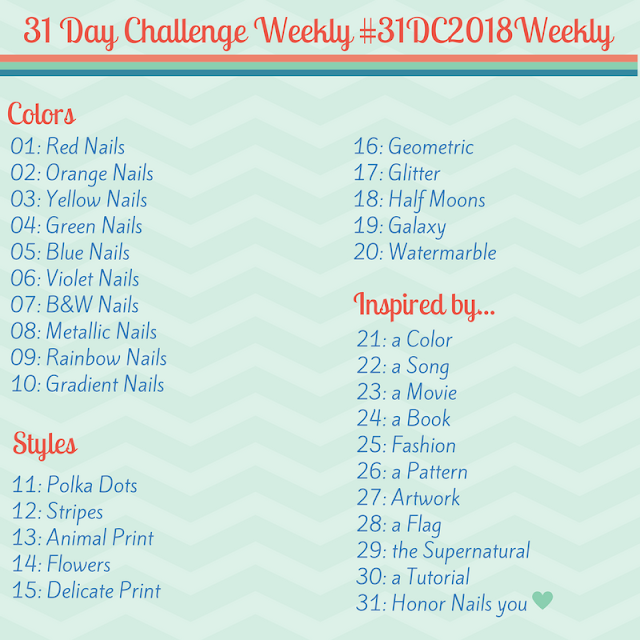 We only have one more prompt left in the 31 Day Nail Art Challenge weekly edition! Be sure to check out the #31DC2016Weekly tag on Instagram, Twitter and Facebook. That's so glamourous! :) Wow!